As a business owner, there are so many things you have to focus on each day — but ensuring the security and protection of your employees, your equipment, and your property needs to be at the very top of your priority list. Install fencing and electric gates — The U.S. fencing market is projected to reach $11.5 billion by 2024. Fencing around businesses can look great and offer plenty of advantages. 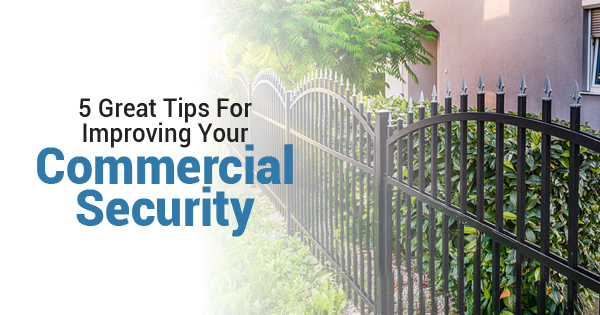 For a commercial business, fences are crucial for not only ensuring privacy to you and your employees, but for security purposes, as well. Electric gates are great for regulating access, allowing employees in and keeping intruders out. Upgrade your doors, windows, and locks — Reinforced steel or thick wooden doors are great for commercial businesses to prevent break-ins. Additionally, high-security, commercial-grade locks are essential for each and every entrance and exit throughout your building. Install plenty of security cameras — If you really want to keep your property and employees protected, placing a few security camera in and outside of your business is the way to do it. Consider purchasing cameras that are motion-detected, which will not only save on recording time, but will be great to quickly identify and record any incident. Upgrade your exterior lighting — If your business isn’t well-lit, criminals will likely think your building is an easy target. Installing and maintaining quality lighting — along with your security cameras — can make a big difference by keeping intruders out or shining a light on them if they actually attempt a break-in. Have quality insurance coverage — Make sure that your business has insurance coverage that protects against theft, vandalism, biohazard spills, and all kinds of additional threats. Ask your insurance agent to walk around your property with you and assess your risks and review your coverage. If you want to learn more about how to improve your organization’s physical security and work with experienced electric gates and guardrail installation companies, give Durham Fence and Guardrail a call right away.